We would like to acknowledge the traditional owners of the land we live on, the Darkinjung people, and all elders past and present. We are all now custodians. Start by popping the bunya nuts out of the big 'pod'. This is easy, however your hands get a little sticky with the pine 'sap'. Now for the tricky part (and the 'free afternoon!) ; shelling the nuts. Start by making an 'x' in the tip of the nuts with a sharp knife. Watch fingers! Then boil the nuts in salted water for half an hour. While still hot, using needle nose pliers, peel the shells off the nuts. Do a few at a time so the others stay warm in the water - it gets harder as they get cooler..
You can also roast the nuts in the oven/fire/bbq. Watch out as the nuts can explode! Pop the shelled nuts into the food processor. Wash and dry some lovely organic basil. I used roughly three times as much basil as nuts. Add a few cloves of gorgeous organic garlic (more or less depending on taste). A good teaspoon of salt and about 5 good glugs of olive oil comes next. Also the cheese if you want. Toss the pesto through pasta with some roasted pumpkin for a truly divine meal. Keep the excess pesto in sterilised jars making sure it is covered in a layer of olive oil. This keeps it fresh. Store in the fridge. Its flowering signals the season changing from cool to warm, the amazing Waratah is the subject of many aboriginal stories. 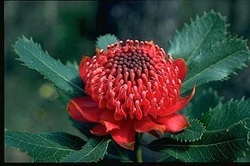 The nector of the Waratah was collected by washing the flowers in spring water and used to supplement a babies diet if the Mother's milk was low. 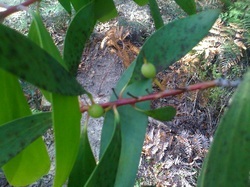 Soft black flaky bark that when peeled off is red/pink underneath. 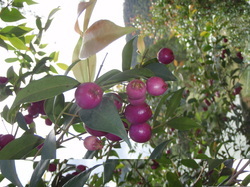 Fruit only ripens when it has fallen from the branch. Favoured food of Kangaroo, Rats, Emu’s and birds. Fruit is eaten by squeezing the fruit from the skin with your fingers. Very sweet! The falling of the fruit is a sign that colder weather is coming, and it's time to take the jumpers and beanies out of storage!